The 4th and final part of this long post. Winners inside, as well as the Best Song and Best Soundtrack categories. Vic's Pick Nisemonogatari ED, Thermae Romae ED, Uchuu Kyoudai OP, Sankarea ED, Lupin the Third: Mine Fujiko to Iu Onna OP, Sakamichi no Apollon OP, Hyouka ED2, Yuru Yuri 2 OP, Tonari OP, Chuunibyou main OP. Can I just call it a 10-way tie? LOL. If I have to narrow it down to just one, it would be Nisemonogatari ED, with Mine Fujiko OP following closely behind in 2nd place. Darren's Pick I like the arrangement of the music and animation of Hyouka OP2, so I guess that would be my pick. The detailed backgrounds, the water ripple effect signifying the disturbances to Oreki's grey life, and Chitanda pulling him out of his grey world and into her coloured one... So much meaning in those one and a half minutes! Same as vic, Mine Fujiko OP comes in a close 2nd. 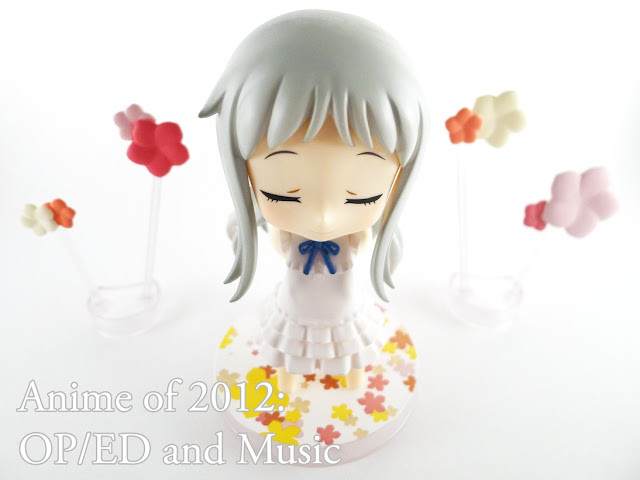 Vic's Pick This year was a great year for anime OP and ED songs. While Feel So Moon is probably the feel-good song of the year, Annabel's Above Your Hand was so good it sent shivers down my spine the first time I heard it. Darren's Pick I've had fond memories of Okazaki Ritsuko's songs for older shows like Fruits Basket and Love Hina, so Friendship was an easy pick for me. Suneohair's Slow Dance and Angela Aki's Kokuhaku were also really strong contenders. Darren's Pick Hyouka's soundtrack was filled with mystery and a certain sense of playfulness. A perfect fit for the show in my opinion.